The Shining Ones and their advanced technology and their influences over the last 8,000 years. 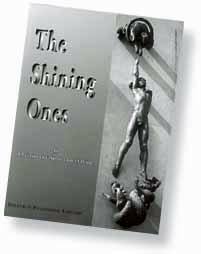 The Shining Ones brings together a lifetime of research and scholarship in presenting evidence of the activities of a group of culturally and technically advanced people, who dominated human progress for several thousand years. Establishing agriculture in a mountain valley in the Near East around 8,500 BC, these sages founded the Garden of Eden, and set the stage for the diffusion of the Indo-European peoples throughout the world. They were deified and are still remembered as gods. We can follow their story within the recently translated Sumerian Kharsag Epics and the deliberately concealed Chronicles of Enoch, with added support from an alternative translation of the later compilation of the Book of Genesis. This book follows their footsteps and influence throughout the world. We now realise that they surveyed and mapped the stars and the earth with great precision. Their brilliant mixed and balanced farming and wildlife management methods still survive in some areas today. Their megalithic and sophisticated building skills still astonish and puzzle experts. Their arts, crafts and sciences, preserved in areas such as China, excel modern equivalents in many ways. Their administrative excellence, through kingship and self-contained city states, provides many surprising solutions for today's troubled world. Their common laws, customs and practical philosophies, corrupted, if not destroyed, by priests and politicians, still offer hope for all of us, to crate a better world. Their ordered and efficient role-societies survived for thousands of years, but were unable to cope with the often predicted episodic catastrophes, inflicted by cosmic radiation, cometary debris and volcanic activity, which brought in their wake fire, flood, drought or climate change. In their previous book The Genius of the Few the authors promised to address the question - From where did these Shining Ones come? They have therefore woven into the text a wealth of additional evidence from the ancient records, to support the popular concept of a spiritual dimension and a spiritual influence. As an outstanding exploration geologist, Christian O'Brien presents his thesis and survey of the ocean floor to support the former existence of the Island of Atlantis in the region of the Azores. This book, along with other past scholarship on the activities and technology of our ancestor gods, provides the links to establish their full story. Ancient myths are now shown to be realities. The re-discovery of a Golden Age is within reach. all we do is so describe their appearance.